[This is a brief introduction to some of the models and methods "on offer" in the areas of self-help, self-understanding, evaluation and assessment of personality. It is intended to whet your appetites for more detailed study - even where that study is designed simply to reinforce an already sceptical response. We have suggested websites and sources at the end of each section, so that you may investigate further for yourself. This issue of Nurturing Potential also has articles on (or focused towards) some of these models showing how they are used by practitioners, therapists and trainers, and we will be providing further examples in future issues. The models we have chosen for this issue are Freud, Jung, Myers-Briggs, The Enneagram, Virginia Satir, and Transactional Analysis. You may click on any of these to go directly to that section, or scroll down this page. Our next issue will cover several other models, including Maslow, Psychosynthesis, NLP, co-counselling and reversal theory. Evaluating personality can be a useful aid to the way we communicate and interact with others in most of our relationships. By understanding why others behave the way they do and how they experience things differently from ourselves, we are better able to connect with them sympathetically and empathetically. This can be of value in such activities as team formation and teamwork. By recognising differences of personality; by acknowledging the need to use the differing skills that accompany those differences; and by understanding that each different personality will enhance and complement the skills of others, all this helps the process of choosing the right people to complete an effective team and reduces the potential for conflict. Little wonder, therefore, that personality assessment systems have become so intrinsic a part of the way teams are created nowadays in so many areas of social, business, and academic life – in creating more effective teams; in improving communication between members of the team, horizontally and vertically; in identifying needs and tasks, and finding the right people to fit them; in training others to create and build on successful and life-enhancing relationships. It is also valuable as a diagnostic tool in interpreting and dealing with illness and disease in the physical body and our mental processes, and identifying how the two are interlinked. It may be said – and we ourselves have some sympathy with this view – that there is too great a multiplicity of systems on offer for personality assessment, many of them having little if any difference from others. And, as in so many areas of life, they include those whose aim is less concerned with helping others than rewarding themselves – albeit that helping others may be a coincidental result. But to condemn the few cynical exponents is to do scant justice to the vast body of genuine trainers and researchers. Freud is now sufficiently "old hat" to render redundant any sort of description of psychoanalysis. We will content ourselves here with merely the simplification that the Id is the primitive, instinctual structure of the mind: amoral, the seat of the aggressive and the sexual desires; the Superego has been imparted to the self by parents, teachers, the ethical concepts of society, etc., corresponding, one might suggest, to a conscience; the Ego is that part of the mind that is in contact with external realities, whose function is to steer a path between these two extremes. Jungian Model (Extravert, Introvert, Ambivert) and Archetypes. Following on from Freud’s concept of the three parts of our personality: Id, Ego and Superego, Carl Jung suggested further parts of personality, and used the power of Myth and Legend to illustrate what he described as archetypes. He further described a part of our personality as the persona, being not our “real self” but the mask we use when relating to others. In contrast to this “acceptable” mask, we have a dark and evil side to our nature that he called the shadow. [Compare this with similarities in the Enneagram] For Jung, the self is that part of us that defines our highest potential. Jung also identified an inherited masculine side called animus, and an opposing feminine side called anima. The part of us that defines our highest potential he called self. We will refer to his personality distinctions of Extravert and Introvert in the section dealing with Myers-Briggs. And further reference to Jungian theory and application is very capably interwoven in Stephen Bray’s article Where Are We Now? Myers-Briggs Model™ (Extravert, Introvert, Intuitive, Sensor, Thinker, Feeler, Judger, Perceiver). Sixty years ago Isabel Myers-Briggs devised a method of personality assessment based on the eight Jungian types parenthesised above, in four pairs of opposites, identified by their initial letters - except for Intuitive where, to avoid the confusion with Introvert, the "N" was adopted as the identity. If you lived mainly in the external world of events and people, or resided in an internal world of thoughts and reactions, you would be E or I. Similarly, depending on how you absorbed information, you might be N or S. Again, do you make decisions objectively or subjectively - using your head or your heart? Are you thus T or F? And in your way of dealing with people and events, do you make snap decisions or do you wait and see? Are you J or P? Sixteen personality types can thus be identified: ISTJ, ESTJ, ISFJ, ESFJ, ISTP, ESTP, ESFP, ISFP, ENTJ, INTJ, ENTP, INTP, ENFJ, INFJ, ENFP, INFP. A series of tests were devised to identify the category that most closely fitted the candidate being tested and, depending upon where their major and preferred characteristics placed them, they could be regarded as fufilling best the following types of occupation (in the same order as the acronyms above). Servers; protectors, nurturers, carers, constructors, doers, performers, artists, executives, scientists, dreamers, thinkers, givers, protectors, inspirers, idealists. This categorisation has been held to be valuable in deciding where people may be best employed; for example as managers or subordinates, as teachers or students, as theoreticians or completers. The fundamental premise of the enneagram is that each of us has one dominant (not exclusive) energy that drives us in everything we do. This dominant energy is our greatest gift so we use it too much and it becomes our chief fault - or sin. This energy, like a prevailing wind that bends a tree permanently, sculpts our interior geography and shapes our entire life. 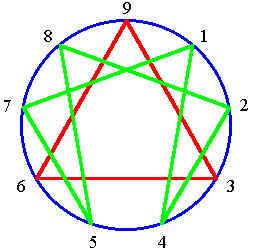 Essentially the enneagram symbol is a circle along whose circumference appear nine equally spaced points marked by the numerals 1 through 9 in succession. There are lines that connect some of the points on the circumference of the circle in an arrangement based on the mystical and cosmological properties of the numbers three and seven. First, one divided by seven yields. 142857142857. . . recurring infinitely. (Actually, any whole number divided by seven will yield a decimal in which the same sequence of numbers repeats). On the diagram, a line connects the point representing one with that representing four. Similarly, a line connects the point representing four to that representing two, and so on. In this way, six of the nine points are connected by lines, the multiples of three being excepted, since the division of one by seven yields no multiples of three. Second, one divided by three also yields an infinitely repeating decimal (.333333…). On the diagram, another set of lines connects all the multiples of three, the three with the nine, the nine with the six, and the six with the three. The nine points on the enneagram are habitually taken to represent nine personality types that, according to enneagram teaching, apply to all people. The nine types fall into three groups of three, associated with the head, the heart, and the gut. As soon as children choose a basic mode of responding to the world (usually around the age of four), they inevitably embody one of these nine personality types. Enneagram teachers claim that by use of the enneagram one can explain why people tend to act in particular ways and can prescribe goals for adjustment and development of their personality. The first step is to determine one’s personality type from among the nine possibilities. Once one’s personality type is determined, according to enneagram teaching, we can learn to achieve greater personal balance and integrity by following the enneagram. "Some think there are sixteen basic personality types and use The Myers-Briggs Type Indicator® . As Jung said, there could be any number of types, even 360 (McGuire 342), if we wished. 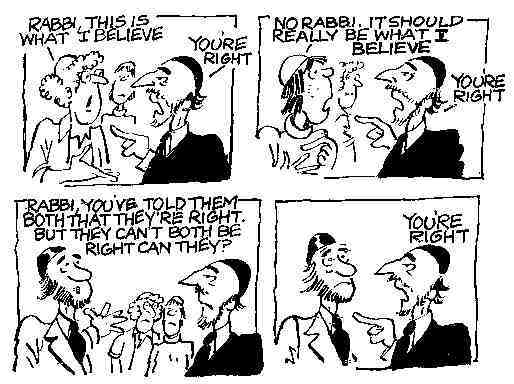 Who is right? Maybe they're both wrong. Perhaps we need only think of two types, those from Mars and those from Venus, as John Gray, Ph.D., claims." "Life is not the way it's supposed to be. It's the way it is. The way you cope with it is what makes the difference," wrote Virginia Satir. One of the key figures in the development of family therapy, Satir believed that a healthy family life involved an open and reciprocal sharing of affection, feelings and love. Her charismatic methods and personal style in her clinical practice and training caused the founders of NLP to use her as one of their original three models (the other two being Frederick Perls and Milton Erickson). According to Virginia Satir, "Problems are not the problem; coping is the problem. Coping is the outcome of self-worth, rules of the family systems, and links to the outside world." She recommended that we pursue our dreams instead of trying to determine whether the dreams can be realized or not. 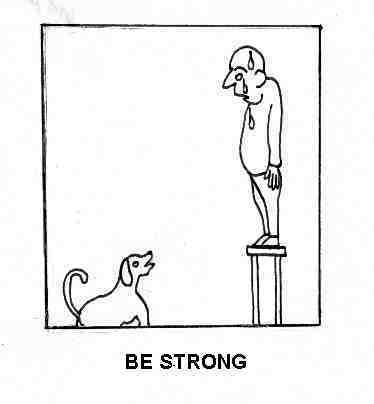 Another significant contribution by Satir was her categorising of behaviour patterns, identifying them by means of the postural stances that people displaying them tend to adopt, and then exaggerating them to make them readily identifiable. The four types distinguished by Satir are the Placator, the Blamer, the Computer, and the Distracter. They are all characterised by body posture, gestures, body sensations, and syntax. The Placator is trying to keep everyone happy, in order to be loved, and in that aim will take the blame for things going wrong; the placator's key word is "agree"; the placator is a "yes-person". The Blamer believes that he is always right unless he yells, no one will accept his model of the world. As a result inside he feels lonely and unsuccessful. The Computer believes that by being "super-reasonable" he will show people how smart he really is; his body language suggests calmness and correctness, but inside he feels vulnerable. The Distracter will indulge in irrelevancies in order to get noticed, even when the words make no sense and when the behaviour pattern is way off beam; they are actually telling themselves that nobody wants them. In her book Self Esteem, Virginia Satir wrote: "I am Me. I own my fantasies, my dreams, my hopes, my fears. I own my triumphs and successes, all my failures and mistakes . . . I have the tools to survive, to be close to others, to be productive . . . I am me, and I am okay". TA is a model of personal and interpersonal relationships developed in the 1960s by Eric Berne. In providing frameworks for analysing thinking and feeling processes, and the transactions that occur between people, TA helps describe and make sense of how and why people do what they do. There is an obvious similarity between TA's Parent, Adult and Child categories (known as the Ego States) and Freud's Superego, Ego and Id. But they are not the same. And the ego states do not correspond to the everyday concept of parents, adults and children. In this respect they are distinguished by having upper case initial letters and are usually referred to as P, A, and C.
Furthermore, each of the ego states may be sub-divided into further states with considerable overlap. The Child, for example, may be the Natural Child, fun-loving, pleasure-seeking, unrestrained and vital. The Adaptive Child, by contrast, is compliant, neat and tidy, and anxious to receive praise. A third, less apparent Child form is known as the Little Professor, and is intuitive and manipulative. Similarly, the Parent is also a complex division. The Nurturing Parent is caring, loving and supportive. The Critical Parent is the part of us that finds fault, speaks in "shoulds" and "oughts", and is ready to blame. The Adult is serious, intellectual, and rational. But each of the ego states contains a residue (in some cases extensive) of the others. Thus we may have the Child in the Adult, or the Parent in the Child. Other guides to self-understanding in TA come in the form of Drivers that result from the injunctions - the "don't messages" - that pass between the Parent and the Child. There are five of these: Try Hard, Hurry Up, Be Perfect, Be Strong, Please (Others). These messages are constantly urging us to behave in ways that we have been taught are "appropriate". We may be "driven" by any or all of them, but it is usual to have one Driver predominant in our personality. Peace of Mind is a Piece of Cake contains many examples of how we strive to follow these Driver messages. It also has a questionnaire that enables you to check out the strength of each Driver in yourself, and you can access it here. The final area of Transactional Analysis that we wish to touch on in this brief introduction is the Drama Triangle - Persecutor, Victim and Rescuer. 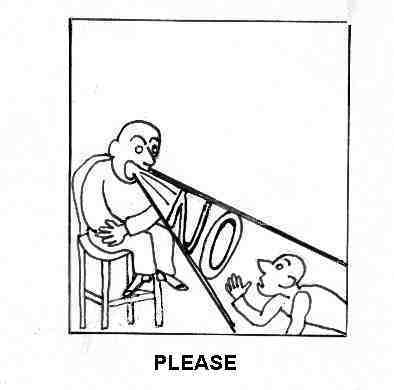 This resonates to some extent with the Satir Model above: the Persecutor corresponding to the Blamer; the Rescuer corresponding to the Placator. There, however, the similarity ends. Our relationships with others frequently moves through the three stages of this Drama Triangle (although in everyday parlance we might talk of a "vicious circle"), where in an attempt to solve the perceived problem of another (a Victim) we take on the role of Rescuer, only to be victimised in our turn by the ex-Victim now-turned Persecutor. You might consider for a few moments the occasions in your life when you may have been (or still are!) involved in a situation such as this. [For a more detailed study of Transactional Analysis we recommend as a first introduction our own little work Peace of Mind is a Piece of Cake (Mallows & Sinclair 1998)that can be accessed via http://www.conts.com/pom.html and may be bought through Nurturing Potential's own Book Offers. For a more detailed introduction we wholeheartedly commend TA Today by Ian Stewart and Vann Joines (Lifespace Publishing 1987).